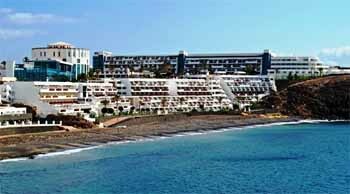 Address: Las Acacias, 6, Playa Blanca (Lanzarote), Islas Canarias. Set on Las Coloradas Beach, Sandos Papagayo Beach Resort offers all-inclusive services 24 hours a day. It features 3 outdoor pools, free WiFi, a spa, and rooms with balconies with views of the sea, Lobos Island and Fuerteventura. Each room at Sandos Papagayo Beach Resort - All Inclusive has a satellite TV and air conditioning. Safes and minibars are available to rent. Sandos Papagayo Beach Resort - All Inclusive has 5 bars and a chill-out terrace with views of Fuerteventura and Los Lobos Islands. On-site restaurants include an international buffet, a pizzeria, an oriental/tex-mex restaurant and a poolside snack bar. The spa includes hot tubs, Finnish saunas and Turkish baths. There is also an on-site gym, a mini-golf course and a multipurpose sports pitch. The hotel staff organise sports, activities and evening entertainment. Children can enjoy the play area, children’s swimming pools and kids’ club. Located 600 metres from Papagayo Beach, the hotel is 4 km from the fishing village of Playa Blanca. Timanfaya National Park is 20 km away. Guests are required to show a photo identification and credit card upon check-in. Please note that all Special Requests are subject to availability and additional charges may apply. This property will not accommodate hen, stag or similar parties. This property is located in a residential area and guests are asked to refrain from excessive noise. Please note premium and à la carte drinks of more than 3 years old are not included in the all inclusive rates. Please note that the full amount of the reservation must be paid upon check-in. Please note that children from 12 years old are considered adults. Please see the following meal times: Breakfast - 08:00 to 10:30 Lunch - 13:00 to 15:15 Dinner - 19:30 to 22:15 Please note that guests must present the credit card used to make the reservation on arrival. If you are not the owner of the credit card used to make the reservation, you must provide a copy of the credit card, a copy of the passport, and signed copy of authorisation from the cardholder for the total cost of the reservation. Please note the published rates for half board stays on 25 December include a mandatory fee for the gala lunch held on that day. Please note the published rates for half board stays on 31 December include a mandatory fee for the gala dinner held on that evening.